Fig. 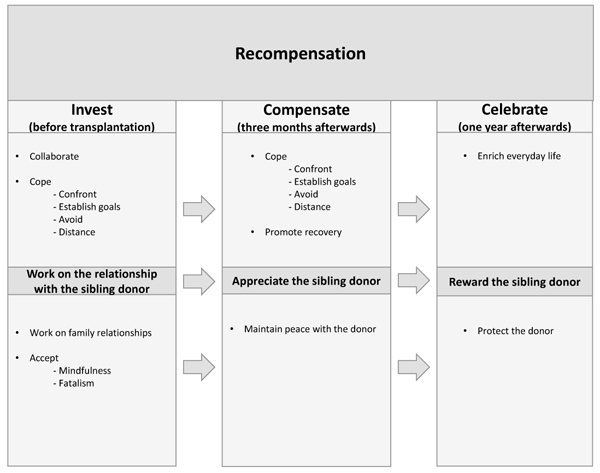 (1) The grounded theory of recompensation among patients transplanted with stem cells from a sibling donor, derived from the analysis of the interviews, involves three distinct phases, before donation - Invest, three months afterwards - Compensate and 12 months afterwards - Celebrate. Recompensation is defined as a lasting compensation given by the recipient to the sibling donor for the loss or harm suffered or effort made, i.e., the stem cell donation. Investment is the starting point for the recipient’s recompensation for the sibling donor. The efforts made in this phase are investments in the transplantation project, i.e., the recipient’s survival. Compensation three months after the transplantation means the start of the pay-back to the sibling donor by a two-fold approach: firstly, coping with the situation and recovering and secondly, thanking the donor and protecting the relationship with her/him. One year after transplantation celebration means paying tribute to the donor and oneself and keeping the stem cells working. In a worst-case scenario it involves protecting the donor from the knowledge that the recipient is suffering and possibly facing death.